Home→Book Deals→July Backlist Feature: Still Night in L.A.
← We live in Dada Times! We at Three Rooms Press firmly believe summer is a time for noir—the grittier, more hard-boiled the better for that perfect beach read. 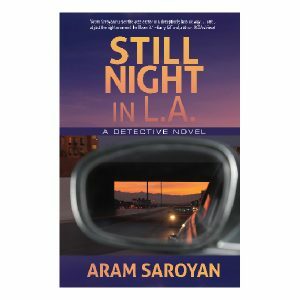 This July, we’re packing in our beach bags Aram Saroyan’s minimalist detective novel Still Night in L.A.—hailed by the Midwest Book Review as “A superbly crafted mystery from first page to last, this is a cliff-hanger of a read that will please any and all hard-boiled private eye enthusiasts.” So to kick off a gorgeous summer reading season, we’re naming Still Night in L.A. our June Backlist Feature, which means that for the entire month, this thrilling, taut mystery will be on sale on our website, at a discounted price of $10 through July 31, 2017. Michael Shepard, a detective with his own set of problems, is hired one morning by a fashionable young woman at her Hollywood apartment. Soon he’s embroiled in a murder investigation that may shed light on a nearly forgotten tragedy. A divorced father wondering how to set his son on a better course in life, the detective gets into deepening trouble as he negotiates a vivid panorama of the town’s modern-day beautiful and damned. Author Aram Saroyan harnesses the hardboiled styles of Chandler, Hammett, and Ross MacDonald into a contemporary tale of information age intrigue. The text is supplemented with cell phone photos taken by Saroyan in the same environs in which the story unfolds.